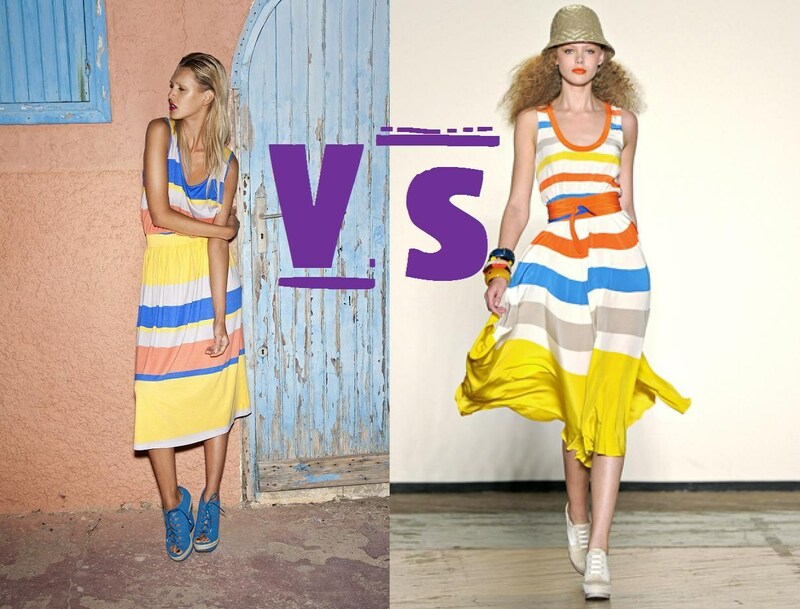 Primark vs. Marc by Marc Jacobs! My faith has been restored in Primark after seeing their Summer collection which will be hitting stores from April onwards. I must admit, recently I became to tire of Primark and barely ever ventured in there. You know you can always grab a bargain at Primark and this season it’s going to be designer inspired bargains you’ll be picking up. Following in the Runway steps of Marc Jacobs they have created this bold colour-blocked midi dress which is only £11.00 and it’s available now so go get it! The April issue of Vogue has also picked out these stunning glitter platform sandals (below) which are again, almost identical to that of Marc Jacobs’ and they come in at £18.00. It’s too good to be true guys so make sure you snap them up quick because you know they’ll all end up on eBay for three times the amount they are in store! Pocket tee £10 in store May, Trouser £15 in store May, Red wedge £20 in store June, Oversized clutch £6 in store June.